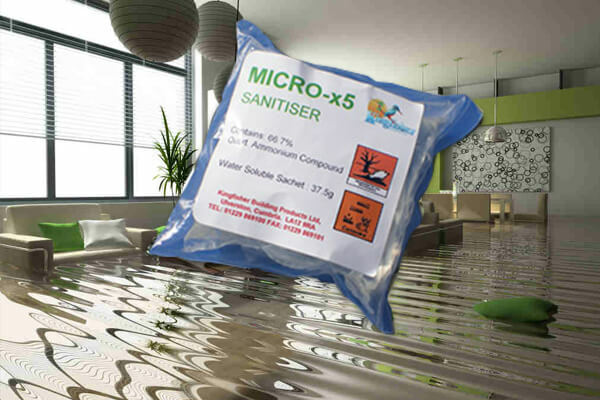 Kingfisher's Micro X5 post-flood sanitiser has been produced to thoroughly disinfect flooded properties prior to commencement of reinstatement works. Heavy Duty Sanitizer/Disinfectant is an extremely concentrated sanitizer and disinfectant containing a highly potent biocide system specially formulated for the control of gram+ve bacteria and Hepatitis B, MRSA, Salmonella, Listeria, Campylobacter and many more including a wide range of viral infections. Ideal for use in the sanitisation of properties subjected to flood water damage. It should be used as a sanitizer prior to initial cleaning out of the property and also used as a part of the subsequent remedial works. Flood water carries with it many types of bacteria, viruses, etc. Once the flood water has subsided, these bacteria and viruses remain within plaster, brickwork, timber joists, floorboards,fixtures and fittings. All of these areas require to be properly disinfectedand sanitised prior to reinstatement works being carried out and ultimately reoccupation of the property. When used as part of initial remedial works after flood damage, the product will sanitize part of initial remedial works after flood damage, the product will sanitize and disinfect the entire area that has been susceptible to bacterial and viral contamination. Brush or spray application is recommended. 37.5g makes 25 litres of sanitiser.